I have finally returned from the Big Travel Trip as the location photographer with the Meteorite Men TV show, which went from a planned 1 week, to a “really? More travel? Ummm, Yes.” 2 weeks, then to a “holy crap, can I be gone that long?” 3 weeks in the field. I did and I was and I had a great time. And I, of course, took many, many photos. On the order of: It was a good thing I brought an external back up with me – many photos. Now that I have taken some time off (I know I will hear the collective gasp once that line is read) I am back to the grind. Coming up on the Backcountry agenda…my most important gig yet to date. This Saturday I will be doing photography for my sister, Beth – at her wedding. And, you ask, how could she be photographer at her own sister’s wedding, shouldn’t she be in it? Well, for one, I volunteered. Then, once that was agreed upon, I negotiated the apparel requirements and there were promises made that I wouldn’t have to wear a dress. Heh. This will all be taking place after my participation in the 3rd annual Tucson Classics Car Show. No, I don’t have a classic car, but I do have photos of really fast...err... dogs, well and nature, etc. I will be at the booth in the morning, then my good friend and extremely talented artist Liz Vaughn and her husband extraordinaire, Kent, will be taking over the booth for the afternoon so that I may get ready for the wedding. By not donning a dress. So when you come out to visit be aware I will be disappearing early afternoon, but the booth will be open for the entire time. And why should I come out to a classic car show you ask? Well aside from seeing me, which is reason enough, a portion of proceeds go to the charity The Reading Seed which helps teach kids to read. Not enough? OK, the entry fee is $5 and you are entered into a raffle to win a Corvette. So…see you there. St. Gregory’s High School, Saturday October 17th from 10 AM to 5 PM, 3231 N Craycroft Rd. And an early notice, so don’t say I didn’t warn you, I will also be participating in the Big Brother Big Sister Southwest Fair-A-Flair October 30 – November 1, 10 AM to 5 PM at the Plaza Palomino, Fort Lowell and Swan, space 79 in the east parking lot. There will be a follow up to this little announcement in the near future. Something for you all to look forward to. But enough promises of future enjoyment, now for the immediate gratification - your desktop photo. This is for those of you who won’t get to see the changing of the leaves this year. 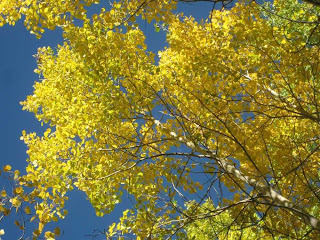 I was reminded (hi Karen, welcome back) the Aspen leaves on the Peaks (in Flagstaff) are just starting their final blaze of glory for the year. Here’s a little remembrance of my trip last fall. Enjoy.